Rome – the city of visible history, where the past of a whole hemisphere seems moving in funeral procession with strange ancestral images and trophies gathered from far-off. Rome is the capital of Italy it has the status of a global city. Its historic centre is listed by UNESCO as a World Heritage Site. Few cities in the world can compare with Rome and it is so full of things to see and does, one would truly need a lifetime in the Eternal City to explore every corner. Ideally, you visit Rome slowly. You sit, you stroll, you take it slow and as it come. You don’t go to see stuff; you let it slip up on you, one piazza, one fountain, one amazing structure at a time. That would be the best case scenario. There are numerous ancient wonders, the Colosseum, the Forum, the Pantheon is some of the big ones but new ancient ruins are constantly being discovered. One of the ways in which is truly eternal. For art, go the Borghese Gallery. For a touristy must, throw coins in Trevi Fountain. Sit on the Spanish Steps, too. Of course, another must see is the country within the city of Rome, named Vatican City. 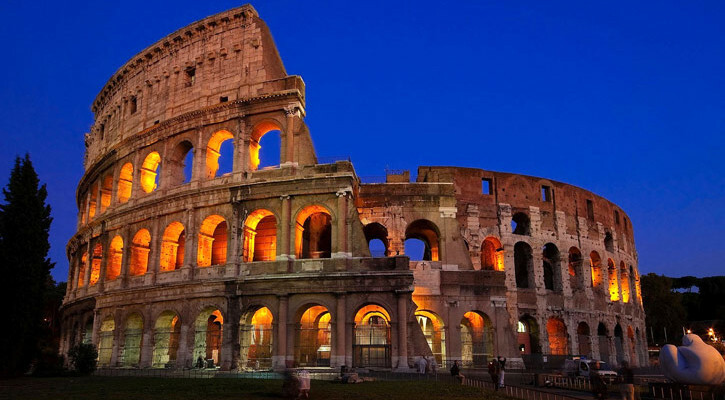 Colosseum stands as one of the crowning architectural achievements of the Roman Empire. A rectangular plaza surrounded by the ruins of several important ancient government buildings at the center of the city of Rome. The Galleria Borghese is an art gallery in Rome, Italy, housed in the former Villa Borghese Pinciana. It is a building that was from the first integral with its gardens, nowadays considered quite separately by tourists as the Villa Borghese Gardens. It’s a fountain in the Trevi district in Rome. Coins are purportedly meant to be thrown using the right hand over the left shoulder. An estimated 3,000 Euros are thrown into the fountain each day. The monumental stairway of 135 steps.